People from Oklahoma City to New York will get to gawk at the fuming iceball at last, which could be bright enough to see with the naked eye. For some time now, keen-eyed Australians have had the ridgy-didge thrill of peeping on a ghostly-white intruder to our skies: Comet Pan-STARRS, a fuming iceball that at times is so brilliant you can see it with the naked eye. What has become a sensation down under is finally making its way to the planet's deprived northern audiences. Beginning this week, Pan-STARRS will creep into the heavens above North America, glowing low on the horizon like an antisocial star that refuses to fit in with the pack. People living along the latitude running from Salt Lake City to Pittsburgh to New York could be able to spot it right after dark, if they can minimize the astronomy-hating features of the modern urban landscape like tall buildings and blinding street lights. 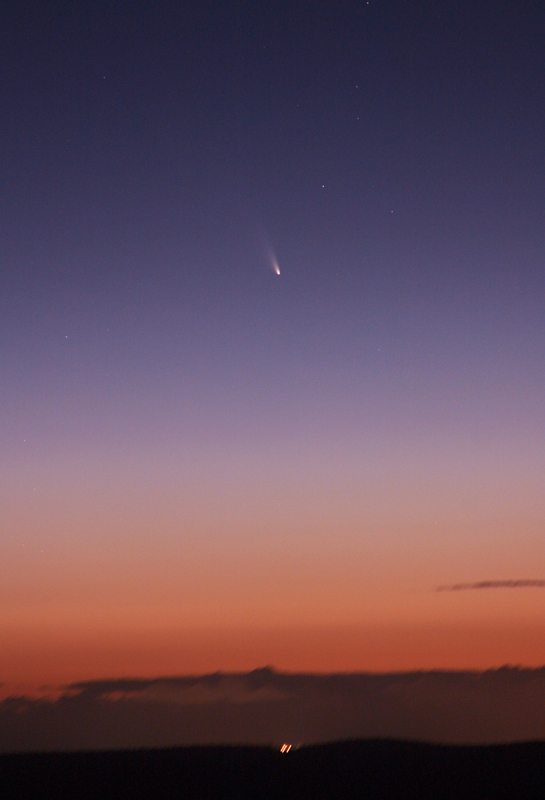 "There is a catch to viewing comet PANSTARRS," said Mainzer. "This one is not that bright and is going to be low on the western horizon, so you'll need a relatively unobstructed view to the southwest at twilight and, of course, some good comet-watching weather." Well, there is one more issue – the time of day, or night, to view it. "Look too early and the sky will be too bright," said Rachel Stevenson, a NASA Postdoctoral Fellow at JPL. "Look too late, the comet will be too low and obstructed by the horizon. This comet has a relatively small window." Pan-STARRS sure took its sweet time getting here. Scientists guess that it started moving in our direction millions of years ago after being plopped out of that vast holding pen of comets, the Oort Cloud, a hypothesized galactic structure so awesome it has at least three bands named after it. From the Oort, it meandered like a lazy moth toward the deadly furnace of the Sun, popping up on a Hawaiian telescopic survey for the first time in June 2011. For spacephobes, NASA soothes that the chunky missile is cutting a "well-understood and safe passage through the inner-solar system," and will not stage a repeat of that horrific meteor that recently blew out all the windows in Russia. Following tonight, the comet might become undetectable as it charges through the blazing light of the sun. But it should blip into view once again on March 12 directly to the right of the crescent moon, at about 5 degrees above the horizon. If you can't see it with skinned eyes, which is possible, try using a decent pair of binoculars. Top image of Pan-STARRS as seen from Mount Dale, Western Australia, courtesy of Astronomy Education Services/Gingin Observatory. Bottom photo courtesy of Yuri Beletsky at the Carnegie Las Campanas Observatory in Chile, via NASA's Astronomy Picture of the Day.